SCVHistory.com LW3429 | William S. Hart | Fritz, Jocko the Monkey, Hart Star in 'Travelin' On' (1922): Publicity Still No. 414-24. 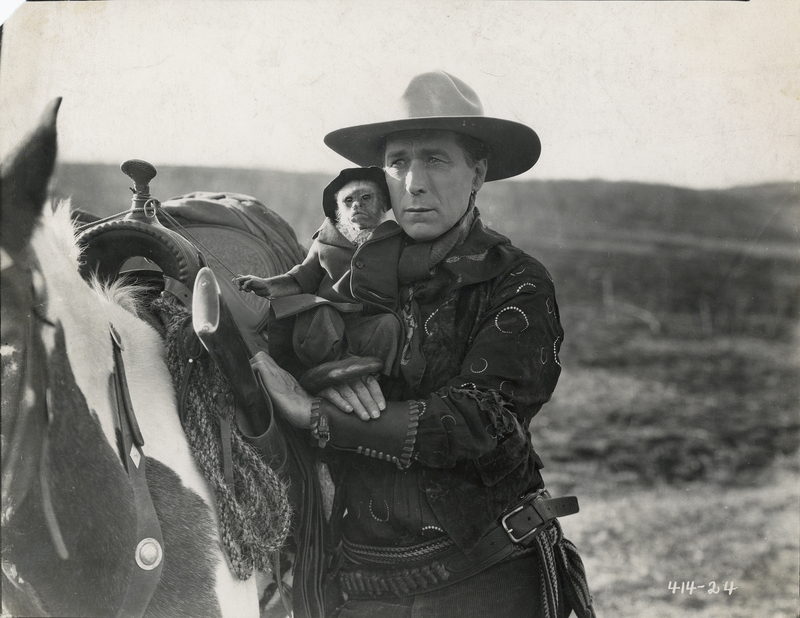 (From left): Fritz the paint horse, Jocko the Monkey and William S. Hart the cowboy actor star in "Travelin' On" (Paramount-Artcraft 1922), directed by Lambert Hillyer from an original story by Hart that can be read here. Original publicity still No. 414-24, 8x10 inches. In the story, Hart's character receives the monkey from a Spanish dance hall girl named Carmen Rosa; after all, what Spanish dance hall girl isn't named Carmen and doesn't have a pet capuchin monkey? This wasn't the first monkey to be named Jocko — the name appears in literature in the 1830s — but this one was the most famous, inspiring several lines of hand puppets and other toys. It seemed that anyone who had a pet monkey afterward just had to name it Jocko. This Jocko appeared in several films in the early 1920s including the 1925 screen adaptation of Sir Arthur Conan Doyle's "The Lost World" and the 1927 Harold Lloyd comedy, "The Kid Brother" — which are easier to come by today than "Travelin' On," although prints of the Hart film are said to reside in the Library of Congress collection and the Museum of Modern Art in New York. LW3429: 9600 dpi jpeg from original photograph purchased 2017 or 2018 by Leon Worden.